Whether it’s your home AC unit, your car’s AC or your refrigerator – the principle is the same. Refrigeration is a closed loop and relies on a cycle of condensation and evaporation, with a refrigerant being compressed until it turns into a liquid and then evaporating to provide cooling. The refrigerant itself has changed over the years, from a compound that depleted greenhouse gases to a more environmentally-friendly product. Still, refrigerant leaks occur, and they are a real problem. Read on to learn more about this problem, and how to fix it. 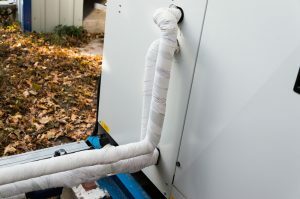 What Causes AC Refrigerant Leaks? It’s somewhat of an old wives’ tale that refrigerant needs to be recharged every spring on every AC unit (although it’s often the case). In this sealed system, if the refrigerant needs to be recharged it has to be disappearing somehow, and that means a leak. Of these three causes, corrosion is probably the most common one – although physical damage to the lines can occur too, such as a weed-wacker getting a little too close to the unit. AC technicians sometimes refer to freon leaks as “champagne leaks,” with tiny bubbles appearing in the evaporator coils of the unit. Sometimes, this can be verified by painting the suspected area with a soapy solution (just like finding a leak in a tire or an inner tube) or using an electronic freon/halogen leak detector. One thing for certain – freon leaks don’t just go away and they don’t get better on their own. Like a leak in an air mattress, you can count on that pinhole leak becoming a bigger problem if it’s not addressed promptly. Sometimes, the leak can be repaired or the portion of the line that’s failed can be replaced completely – unfortunately, this is part of the reason why home AC units have a lifespan of only 10 to 15 years. If your AC is leaking refrigerant, it’s not something you want to try to diagnose and repair yourself. In fact, you can void the manufacturer’s warranty by allowing anyone other than a trained technician to service the unit. If you’ve been noticing poor performance and cooling or your unit has been short-cycling, with the compressor and fan running for only a few minutes at a time, shutting off for a few minutes and then repeating the cycle, it’s time to call a professional. AC refrigerant leaks are more than just inconvenient, they can be toxic for families and pets. While refrigerant isn’t carcinogenic, exposure can cause dizziness, loss of concentration, rashes, and irregular heartbeat. Don’t suffer in a stuffy and uncomfortable house, and don’t risk exposure to this stuff – if your AC isn’t performing well, go ahead and make an appointment for a service call for AC repair and recharge. Contact Greenleaf Heating & Cooling for AC repair in La Puenta, CA today!